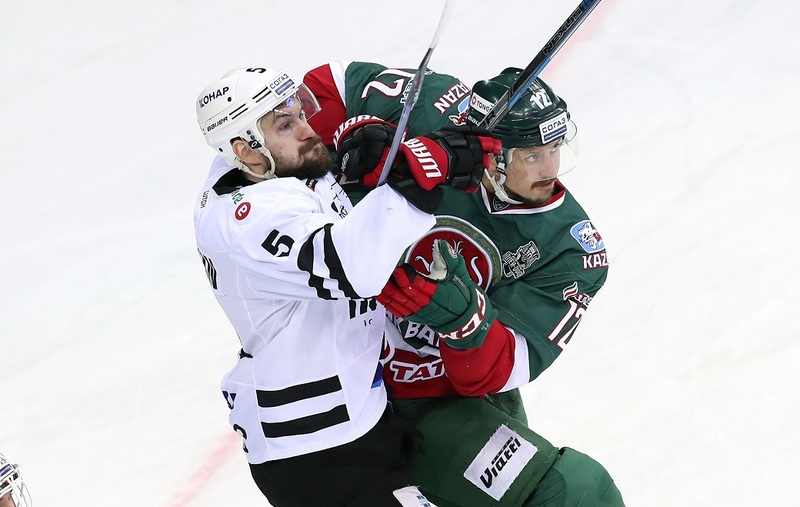 Justin Azevedo celebrated his 30th birthday with a landmark goal and a game-winning assist to help Ak Bars recover from a slow start and take a 2-0 lead in the Eastern Conference Final. After Traktor raced into a 2-0 lead in Kazan, the home team hit back in the second period. Azevedo’s 100th KHL goal put Ak Bars in front for the first time midway through the game, and later he supplied the pass for Danis Zaripov’s game-winner as penalty trouble ravaged the visitor early in the final frame. At first, though, it was all about Traktor. For the second game running, Richard Gynge put Traktor ahead. An early power play saw the visitor pile forward, and after Nick Bailen’s shot was saved, the Swede got to the rebound to open the scoring. It took less than 90 seconds for Traktor to double its lead, with Semyon Kokuyov pulling the Ak Bars defense out of shape before teeing up Alexander Rybakov for a shot from between the hash marks. With barely five minutes played, the Chelyabinsk team was in a commanding position. That lead lasted until the end of the first period, but early in the second Ak Bars produced a double salvo of its own to tie the scores in the space of 91 seconds. First came Andrei Markov, with the defenseman getting his first goal of the playoffs when he unleashed a wicked one-timer from the left-hand face-off spot after a Danis Zaripov feed from the goal line. Then Markov went close again before Alexander Burmistrov made it 2-2 in the 25th minute, firing home from the slot after Alexander Popov’s pass from behind the net. Stunned, Traktor called a time-out, but the visitor could not regain control of the game. Two penalties left Traktor playing with just three skaters, and Ak Bars needed just two seconds to capitalize. It was a move straight off the playbook: Vladimir Tkachyov won the face-off, Stanislav Galiyev fed the puck back to Azevedo, and the Canadian whipped in a shot that beat Vasily Demchenko and went in off the post. However, Traktor was not done just yet. Alexei Kruchinin continued his impressive playoff form with a terrific individual goal three minutes before the intermission, taking the puck from deep in his own territory and surging into the heart of the Ak Bars defense before opening a lane to unleash a wrist shot past Emil Garipov. After two periods of pulsating action, the game was locked up at 3-3. The third period began with Traktor taking a string of penalties. The key infringement was Marsel Sholokhov, ejected from the game after his high stick left Artyom Lukoyanov picking his teeth off the ice. Seconds later, Alexander Shinin picked up a minor, and Traktor had to kill a 5-on-3 situation. A further ruling against the visitor saw Ivan Vishnevsky in the box, and this time Ak Bars took advantage of its extra two men while Alexei Petrov talked himself into an early return to the locker room. Zaripov scored the goal, punishing Traktor’s wayward discipline when he smashed home Azevedo’s pass. After so long playing shorthanded, errors crept into the visitor’s play and, on this occasion, the two defensemen got too close together in front of the net, offering an inviting pass for Azevedo to set up his team-mate. 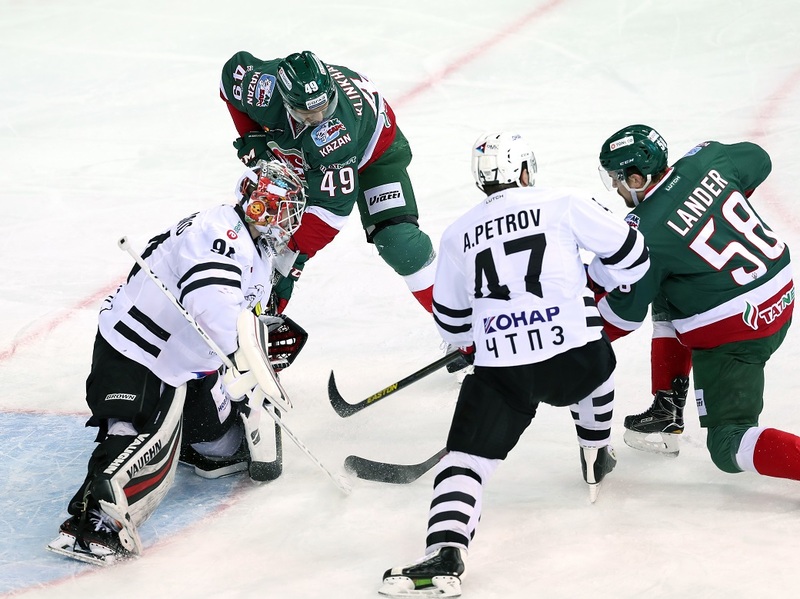 It wasn’t until the 47th minute that Traktor finally got back to full strength, and by that time Ak Bars knew it was in a position to close the game out and take a commanding 2-0 stranglehold on the series. The final stages followed a predictable pattern: Traktor trying to push forward, Ak Bars holding a solid defensive line and refusing to allow the opposition to get inside and have a good look at Garipov’s net. Even in the closing moments, with Demchenko called to the bench, Traktor struggled to create a clear opportunity for the equalizer and Ak Bars held on for a win that could change the face of the series.